March 10, 2017: The splashpad will open on Saturday, April 1st at noon. November 30, 2016: The splashpad is complete and will open in April 2017! We will schedule a grand opening for April. October 26, 2016: The concrete has been poured to hold the water elements in place. All that’s left to do is masonry work on the building, landscaping and connection to the public water system. October 14, 2016: The water features of the new splashpad are going up. October 12, 2016: The concrete has been poured for the new splashpad! Next, we’ll be adding masonry to the chemical building and working on the landscaping details. September 9, 2016: We are currently working with the Health Department to obtain the permit for the new splashpad. 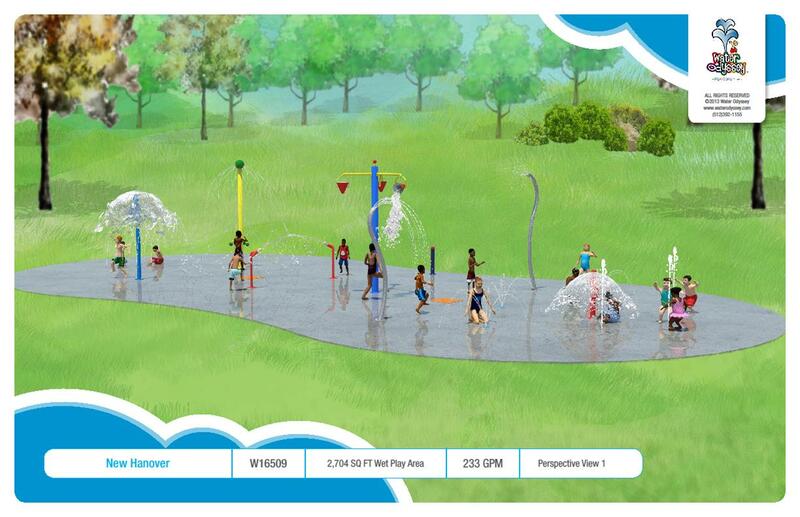 July 11, 2016: The new splashpad is getting closer to becoming a reality! It is currently in the permitting stage. July 1, 2016: A ribbon cutting ceremony has been scheduled for July 20th at 10am to celebrate the grand opening of the new playground. June 21, 2016: Construction of the inclusive playground is nearing completion! We are hoping to open the playground around mid-July. Check out some of the new playground features below. June 3, 2016: The 5-12 year old playground has been removed and is now in storage waiting to be retrofitted for its new home at Northern Regional Park. Construction has begun on the new playground. Removal of the toddler playground for installation of the splashpad will begin once the new playground is complete. 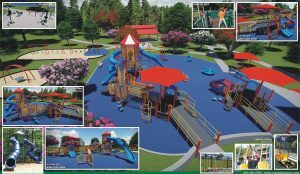 Trillium Health Resources has awarded New Hanover County Parks and Gardens with a $750,000 Play Together Grant which will go towards constructing an inclusive playground at Hugh MacRae Park. The new playground will be built in place of the current 5-12 year old playground and will provide inclusive play opportunities for children with all abilities and of all ages. Features will include accessible equipment for children with mobility issues, bright colors for the visually impaired and quiet nooks for children with autism. There will be elements for smaller children, ages 2-5, and a separate area for those 5-12 years old. Nearby, adults will be able to exercise on the new fitness stations while their children play on the playground. 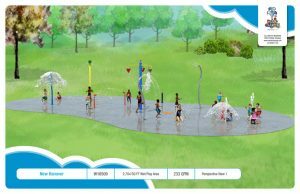 The project will also include a new 2,700 square foot splashpad that will take the place of the current toddler playground. The splashpad will use a recirculating water filtration system to ensure safety, eliminate waste and minimize operating costs.